Anybody who has spent several years in Pennsylvania would agree that our winters are by far our most unpredictable season. From an angler’s point of view, this holds most true in February. 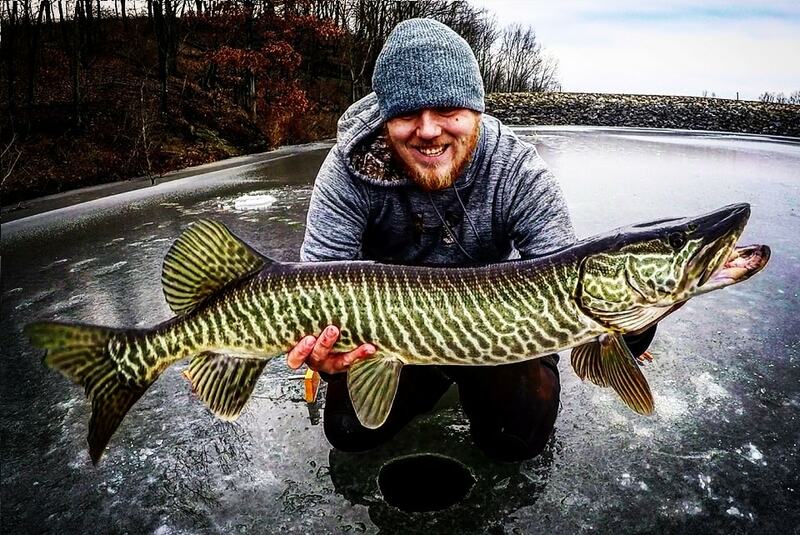 During that time anglers of Pennsylvania could be still waiting for their ice to form, still be in the heart of ice fishing season, or everything has defrosted, and spring is just around the corner. With that said here are 5 detailed tips you can apply to any of these situations. -Noted- These tips come from a collective group of die hard anglers located across north east Pennsylvania. While these tips originate in NEPA, they can be applied to cold water fishing all over the state and beyond. Small shallow bodies of water are the first to freeze but are also the first to defrost. Large deep bodies of water take a longer time to accumulate ice but maintain ice significantly longer when exposed to warm weather. The affect that rain has on the ice is often not as dramatic as most people fear, however where this becomes a large factor is when rain is combined with an In-flow. Any creek/river that flows into a body of water following warm rain will destroy all ice in the immediate area. Rivers are almost exclusively open water fishing. There are little to zero rivers in Pennsylvania that offer safe ice fishing. They are the very last to freeze, and often never do. If your goal is to go ice fishing, be sure to consider what the weather has been doing. If the cold just hit be sure to stay at smaller bodies of water. As the season changes, be sure to seek ice on larger, more substantial bodies of water that can tolerate extended warm stretches. -Noted- This is a general guideline; all ice can be unpredictable and should always be checked for safety. If you are itching for open water fishing, be sure to look for small ponds, inflows, and rivers following warm spells. Warm rain can create an opportunity in the dead of winter to find open water if you pick your spot right. Be sure to look for low incline ponds that the warm rain will collect in. Know where you are fishing, and what lives in there. You can’t ever go wrong presenting what they are naturally eating. Check fish stocking programs and talk to local anglers. This homework will benefit you in the long run. Whether you’re fishing live bait or artificial, presentation will be key. Slow and methodical is typically key for most fish in Pennsylvania, with the exception of some species that remain active during the cold such as Pike, Pickerel and Trout. These cold water hunters typically prefer more erratic baits. Downsizing is the safe option. Fish will more readily eat baits that digest easily and take little energy to consume. Wax worms and fatheads will tempt a vast majority of PA fish species. Medium shiners also work well for larger more predatory species. Small jigs and spoons tipped with little soft plastics work great especially when fishing on large schools of fish, such as Sunfish, Perch, and Crappie. Overall whatever you're casting or dropping down your ice hole, present it slowly, incorporate pauses, hit the bottom often, and be ready to change it if it isn’t producing, but give it a chance. Bites don’t often come quickly. Almost all species of fish continue to feed over winter, so going for “anything that bites” is a perfectly good idea, which typically produces results. That being said you can make your job a little easier by keying in on fish that stay more active in the winter. Panfish are your best friend. Almost every single panfish species in Pennsylvania stays surprisingly active in frigid waters. This option is great fun and can produce fast action and lots of fish. These feisty fish also offer great entertainment if you plan to wait out for larger more elusive fish. The Esox tree rules supreme. In Pennsylvania we have the big 4 in the Esox family tree. The Northern Pike, Chain Pickerel, Tiger Musky, and Muskellunge. These hunters have little regard for the cold water, and have no quarrels about actively hunting in the dead of winter. If you don’t have the patience for methodical panfish jigging, these are the fish for you. Trout are a beloved species at all times of year, it’s not a surprise to most that they prefer the cold water. This is a great option for somebody who is intimidated by the huge amount of ice fishing gear. If you are targeting them through ice, you don’t need to deviate too far from what your using in open water. Whatever you decide to target, take serious pride when you catch it. Catching fish in winter isn’t easy, and takes patience and persistence. Don’t get frustrated, mistakes will happen and learning from them is key. Typically, river fish are easier to locate during winter. This is due to there being limited amounts of calm, deep, slack water. Look for deep calm pools after river bends and in-flows. Current breaks: At first thought, this seems to only apply to rivers. However, in the mouth of an inflow going into a lake, pond, or reservoir fish will use currents breaks like rocks, tree branches, and inside turns to escape the energy consumption of fighting a light current. While still having food floating down river right to them. In the event of no water currents, fish will often opt to stay at locations that have a healthy mix of cover, and prey. An example would be heavy weed cover that they can hide in should a predator come near. But also can hunt in for small insects and other organisms. Large rocks, bridge pilings, and fish cribs are all viable options. Nothing in fishing is fact, however in the winter you almost always will find fish in the bottom half of the water column. Often right on the bottom. Keep this in mind while actively fishing. Every fishing location is different, and the fish in them have their own unique characteristics. These are base guidelines you want to begin with, then begin to explore and expand your knowledge of that particular fishery. As these tips won't work everywhere, every time. Overdress! Always better to strip off gear than not to have it available when you need it. Exert energy only when necessary. All the layers in the world won’t save you from a layer of sweat in -20 Fahrenheit. If you have to load/unload substantial gear, do so before layering up. Bring food and drink. When things are slow and you’re debating on what to do next, cooking up a hotdog and cracking a cold beverage is a great way to lift your spirits while you revise your game plan. With preparation and good spirits, anyone can spend all day out fishing in the dead of winter. Fishing the winters of Pennsylvania is not for the faint hearted. You must be committed, determined, and relentless. But when everything falls into place, and you pull that fish out of the water. The steam from your excited breath clears, and you see your prize, set to the unbelievably gorgeous backdrop of our Pennsylvanian winters. That is the moment that brings us back.